a) For TGT (‘Sanskrit):Candidate should have studied Sanskrit in all the years of graduation with atleast 50% marks in Sanskrit and also 50% aggregate in Graduation. b) ForTGT(Hindi):Candidate should have studied Hindi in all the years of graduation with atleast 50% marks in Hindi and also 50% aggregate in Graduation. c) ForTGT (English): Candidate should have studiedEnglish in all the years of graduation with atleast 50% marks in English and also 50% aggregate in Graduation. 2. Geography/History should have been studied in all the years of Graduation with atleast 50% marks.case of Honours Degree in History, the candidate should have studiedGeography /Economics/Political Science in first and / or Second year of graduation with atleast 50% marks in History in aggregate and atleast 50% marks in other subjects indicated above at graduation level and also atleast 50% marks in aggregate at graduation level. 3. Similarly in case of Honours degree in Geography , the candidate should have studied History/ Economics/Political Science in first and / or second year of graduation with atleast 50% marks in geography in aggregate and atleast 50% marks in other subject indicated above at graduation level and also atleast 50% marks in aggregate at graduation level. (1) The candidate should have studied Maths in all the three years of graduation with any two subjects out of Physics, chemistry Electronics, Computer Science, and Statistics. point No. 1 above with atleast 50% marks in each subject at graduation level and also atleast 50% marks in graduation. (3) B.A (Hons) in Maths and B.Sc. (Hons) in any subject other than Maths is not eligible for the post of TGT (Maths). (2) The candidate with Honours Degree in Botany/Zoology/Chemistry with atleast 50% marks in B.Sc should have studied other two subjects with atleast 50% marks in each of them at graduation level. (3) PreferablypassintheCentralTeacherEligibilityTest(CTET)PaperII, conducted by CBSEin accordance with the Guidelines framed by the NCTE for the purpose. (4) B.Ed. or equivalent degree from recognized University. b)Preferably pass in the Central Teacher Eligibility Test (CTET) by the NCTE for the purpose. c) The candidate should possess two years Diploma in Education (D.Ed.) orBachelorin elementaryEducation (B.El.Ed). d) The candidates having higher qualification / professional qualification B.Ed or B.Ed (Special Education) are not eligible for the post of Primary Teacher. 1)Senior Secondary School Certificate with 50% marks or Dance intermediate with 50% marks or its equivalent and Bachelor Degree Teacher in Dance or equivalent from a recognized University. 1.B.E. orB.Tech. (ComputerScience / IT)froma recognized University or equivalent Degree or Diploma from an institution /university recognized by the Govt. of India. Post Graduate Diploma in Computer and PostGraduate degree in any subject form recognized University. ‘B’Level from DOEACC and Post Graduate degree in any subject. ‘C’Level from ‘DOEACC’Ministry of information and Communication Technology and Graduation. i. ClassXII pass or Equivalent from recognized board or University. ii. Typing speed of 35 w.p.m in English OR 30 w.p.m in Hindi on Data entry Computer. 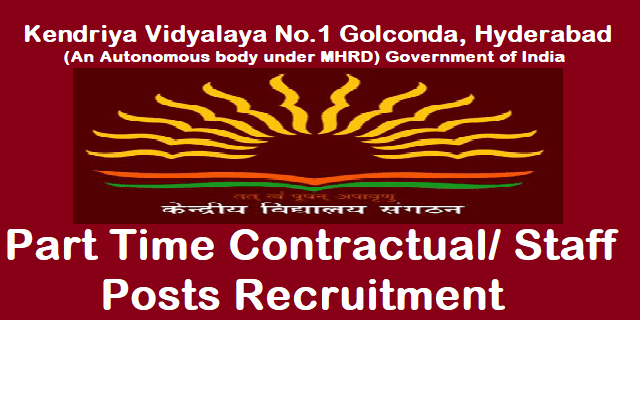 Applicants are directed to download the Bio-data form available on the website of the Vidyalaya (www.kv1golconda.edu.in ) and submit on or before 17.02.2018 along with Xerox copies of certificates. Eligible applicants are only requested to attend the interview/ Screening test along with original certificates/documents of the requiredqualification.